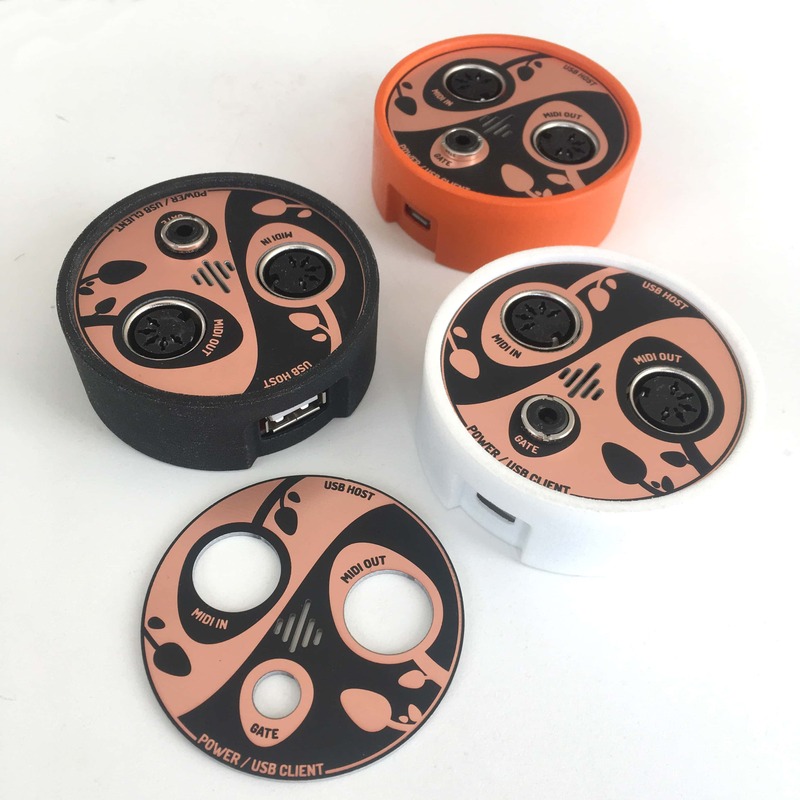 The RK-005 hosts USB MIDI devices and USB Hubs. 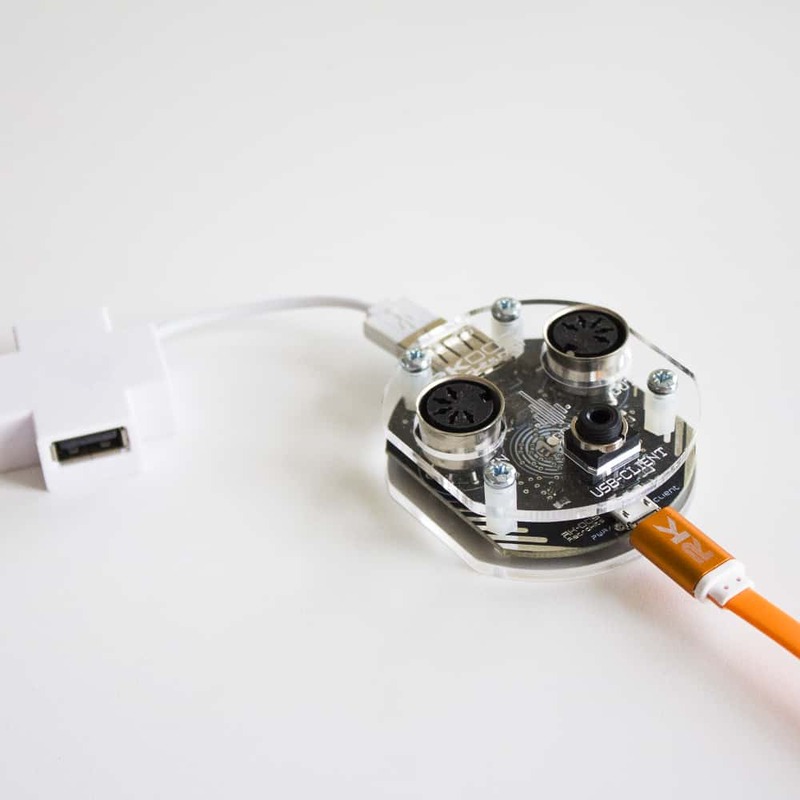 It interconnects USB-Devices and sends the merged MIDI to the DIN5 out port. 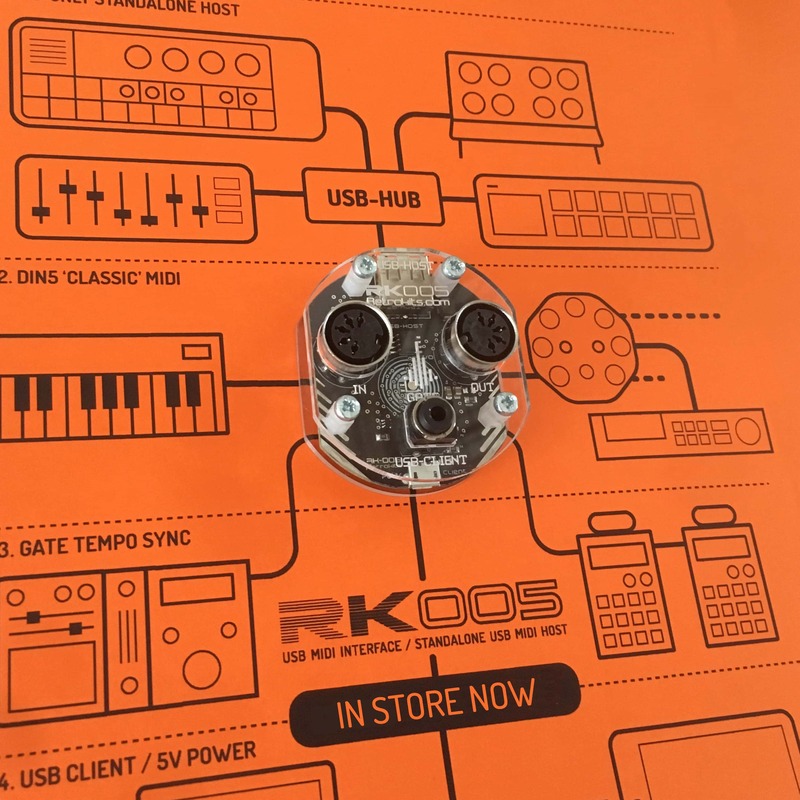 Where other USB-Hosts do host-only, the RK-005 is also a Class Compliant MIDI device as well. The RK-005 connects to a computer, phone or tablet and gives you a fast and solid MIDI In and Out from your DAW. Even simultaneously. 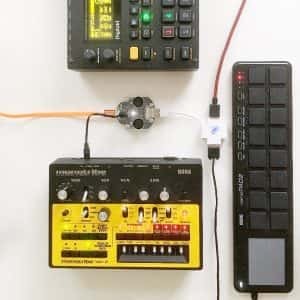 Translates MIDI clock to Gate-out: Sync up Pocket Operators, Monotribes or Modular systems to your USB or DAW setup with ease. 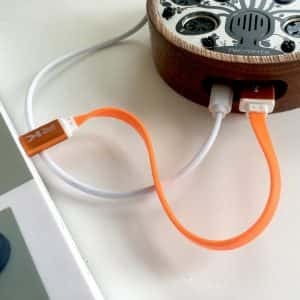 * Gated Clock via 3.5mm Jack output. 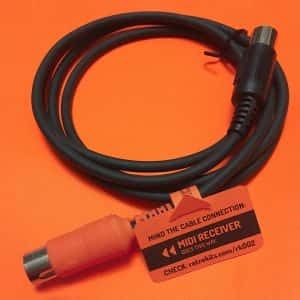 12bit resolution CV + Gate functionality on the jack output port. 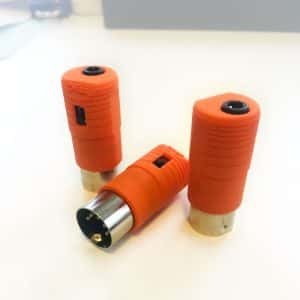 BEWARE that this port outputs 0-3.3v and is not overly protected! So don’t accidentally plug it into outputs with voltages it can’t handle! Don’t be fooled by it’s compact appearance (yes – we have sort of a legacy in stealth utilities! 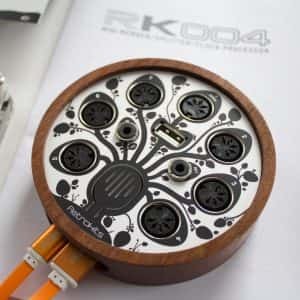 ): The RK-005 is a small device which can combine all layers of the MIDI spectrum… and beyond! 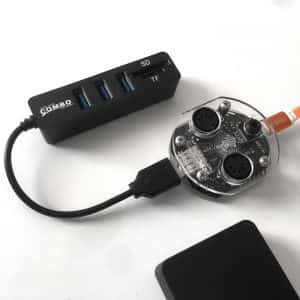 And where other USB-Hosts do host-only, the RK-005 is also a Class Compliant MIDI device. This means if you connect the RK-005 to a computer, phone or tablet: It will give you a fast and solid MIDI In and Out from your DAW. Even simultaneously. The RK-005 is a 2-in-1 device! 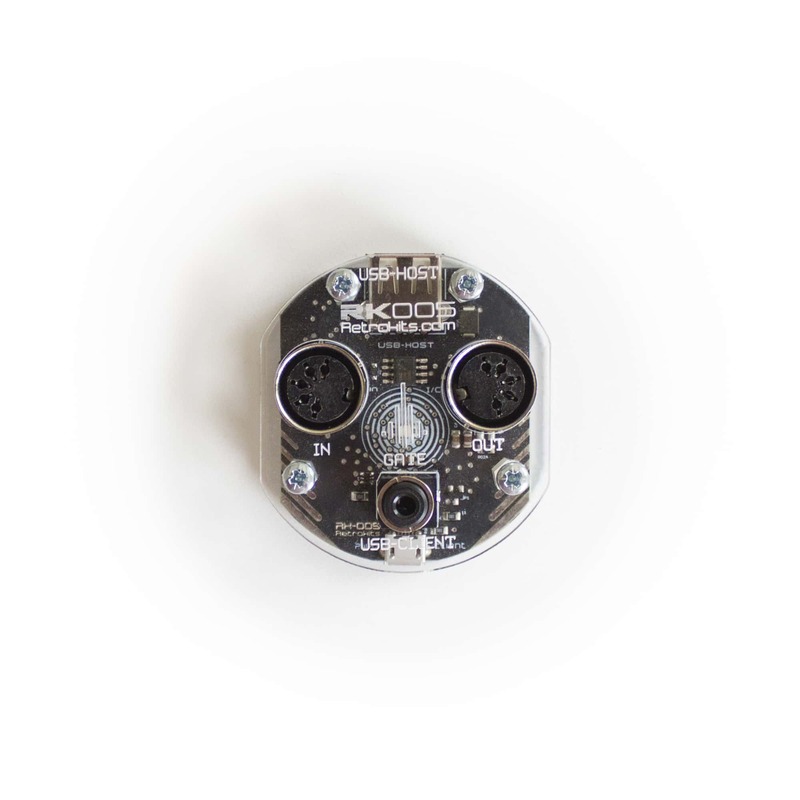 If you’re also looking to connect other gear which only have gate triggers to listen to: The RK-005 has an on-board MIDI clock to Gate converter. You can sync up your Pocket Operators, Monotribes or Modular systems to your USB or DAW setup with ease. On firmware 1.7 we have even added 12bit analog voltage out on the minijack port (‘Control Voltage’) Which can be driven from keytracking, Aftertouch, Pitch or a MIDI Controller. Beware though Don’t accidentally plug it into output voltages which exceed 3.3v! This is a feature we added for experimental (and creative) purposes. 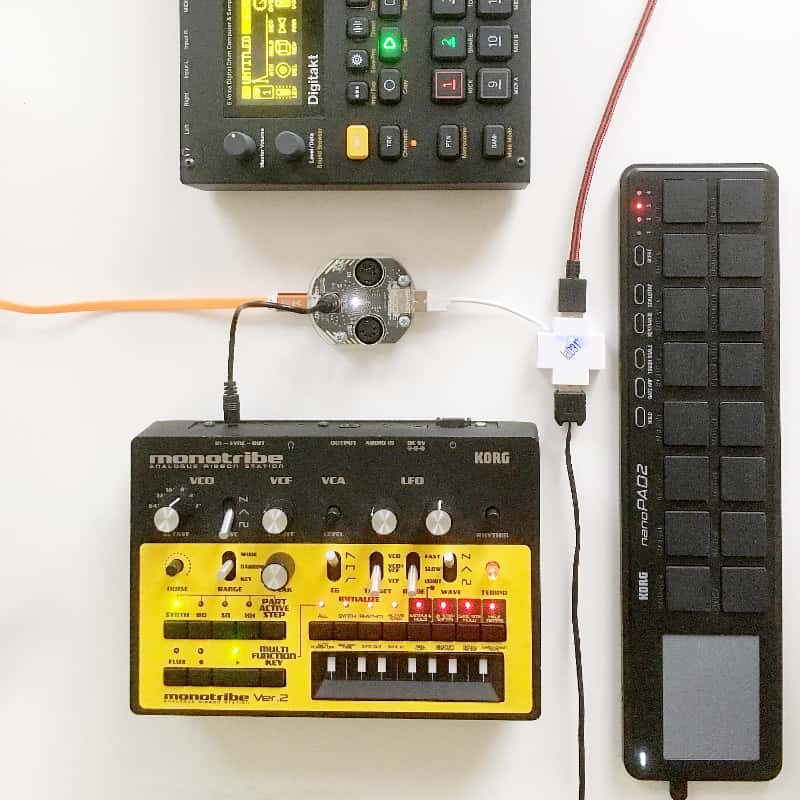 With the RK-005 you can now create that compact live or production hardware setup: full control without the full table.